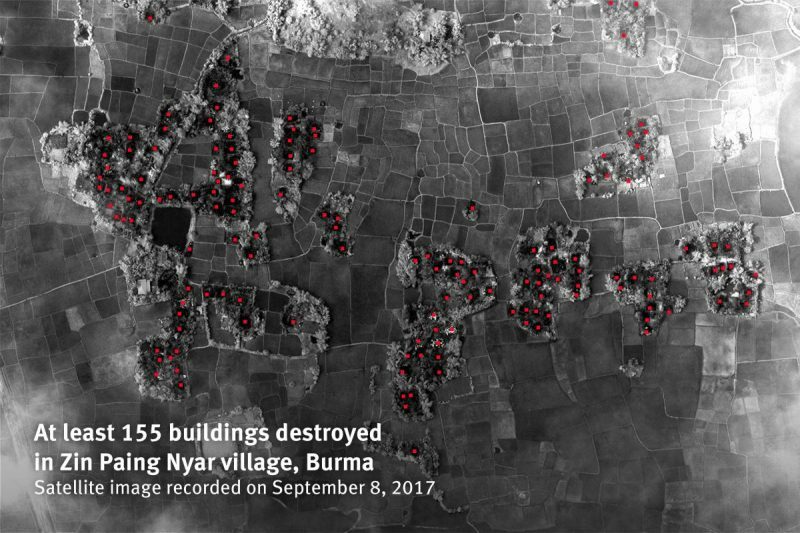 Satellite image from Human Rights Watch. Ample anti-Rohingya propaganda has also spread online, reinforcing the Myanmar government’s contention that Myanmar-born Rohingya are in fact “Bengalis,” or undocumented immigrants from Bangladesh. While many such messages have spread organically, researchers saw a spike of 1,500 new Twitter accounts after clashes broke out on August 25. The accounts are spreading pro-Myanmar government messages and feature hashtags such as #Bengali and #BengaliTerrorists. It is unclear who is behind the new accounts. The conflict is a hot topic in South and Southeast Asian social media circles, and has proven to be a divisive issue for both citizens and governments in the region. In Indonesia, which is majority Muslim, a veteran journalist was accused of defamation for comparing former Indonesian President Megawati Sukarnoputri to Myanmar’s Aung San Suu Kyi in a Facebook post. In the post, journalist and documentary filmmaker Dandhy Dwi Laksono wrote that if Myanmar’s government is being criticized for its treatment of ethnic Rohingya, the Indonesian government should similarly be held liable for suppressing the independence movement on the Indonesian island of West Papua. He further compared Suu Kyi’s silence on the persecution of the Rohingya to Megawati’s role as party leader of the government, which has recently intensified the crackdown on West Papuan independence activists. If he is prosecuted for and convicted of defamation, Dandhy could face up to four years in prison. At the other end of the spectrum, the Indian government requested that Twitter locally censor the above tweet expressing solidarity with the Rohingya. An estimated 40,000 Rohingya live in India, where their citizenship status has been in legal jeopardy due to recent efforts by conservative legislators to render them “illegal” immigrants. Palestinian human rights activist Issa Amro was arrested by the Palestinian Authority for criticizing a journalist’s arrest in a Facebook post. The post, which is no longer visible on the platform, denounces the arrest of Ayman Qawasmi, who was arrested after openly criticizing the PA and calling for the resignation of Palestine’s President and Prime Minister. Qawasmi was released, but Amro remains under arrest, charged with stirring sectarian tensions and “speaking with insolence”. Amro is also facing challenges in an Israeli military court on disputed charges relating to his political protest activities. The UN High Commissioner for Human Rights published a statement expressing concern at his arrest and urging his release. El Faro and Revista Factum, two highly regarded independent news websites in El Salvador, received violent threats on social media targeting specific journalists who have been covering corruption in the country’s criminal justice system. One threatening tweet said Factum and El Faro journalists would “end up like Christian Poveda,” a French-Spanish journalist killed by members of the Mara Salvatrucha gang in 2009. The Head of the Salvadoran National Police, Howard Cotto, and Vice President Oscar Ortiz said they were aware of reports of illegal activity by police officers and promised to open an investigation. Demonstrators gathered outside Twitter’s Japan headquarters in Tokyo, demanding the company take more action to rein in hate speech. Tokyo No Hate, a volunteer collective of activists, led the demonstration by covering the sidewalk in front of the office with printouts of abusive tweets. Protesters symbolically stomped on the tweets before crumpling them up and depositing them in recycling bins. A secret decree by the Chilean government recently made public by investigative journalists modifies the country’s law about the interception of communications. It extends requirements for companies to retain data on digital communications made in Chile from one to two years, and asks companies to store additional metadata on communications. It also contains provisions that could stymie the use of encryption technologies that would hinder the delivery of this information. The Santiago-based digital rights group Derechos Digitales says the law may be unconstitutional. If you wanna run a chat group in China, be ready to censor your friends. Photo of a Chinese internet cafe by eviltomthai on Flickr and used with Creative Commons license. New regulations in China will make chat group administrators responsible — and even criminally liable — for messages containing politically sensitive material, rumors, violent or pornographic content, and news from Hong Kong and Macau that “has not been reported by official media outlets.” This represents a bold policy shift by extending the work of regulating online content beyond government workers and companies to the users themselves. The new rules also require Internet chat service providers such as WeChat and QQ to verify the identities of users and keep a log of group chats for at least six months. The rules require the companies to moderate users’ access to chat services depending on their “social credit” rating: those who break rules may see their rights to manage group chats suspended and be reported to the government. Group managers will be seen as responsible for the management of the group. Mahsa Alimardani, Ellery Roberts Biddle, Oiwan Lam, Mong Palatino, Elizabeth Rivera, Nevin Thompson and Sarah Myers West contributed to this report.